Off the cuff: When Pope Francis turned and looked at us! There we were — two priests and I — stuffed into a soundproof cubicle deep in the bowels of Zayed Sports City, Abu Dhabi. We had headphones clapped around our ears, and a computer screen and microphones in front of us. In the cubicle next door were two Arab translators similarly boxed up. A small pot of diversity, come to think of it — an American, an Argentine, a Lebanese, an Egyptian and I an Indian — all Catholics eager to have been a part of the first Papal Mass in the UAE about to start on the grounds above us. But we were duty-bound to our role as commentators tasked to guide those watching the Mass through media channels. When the role was first offered to me I was stunned for I had never done this. Until the day before the event, when we were brought into the stadium for rehearsals, I had had no idea where I would be sitting, and what kind of equipment I would use. I did imagine a glass-fronted kiosk facing all the action, with high-tech screens, microphones and fancy knobs that I would have to master as fast as possible. Instead we were herded out of the grounds with its sea of white chairs and pristine altar, and driven away in a buggy by a muscular German with tattooed arms. We stopped at ground level, and were led into the depths of the stadium. Soiled paper cups and tissue paper, food wrappers and cans lay strewn in the carpet-lined corridors. My hopes had now begun to seriously waver. But worse was to come. Our room ‘without a view’ was cold and grey, lit by bare fluorescent tube lights! Over the course of the evening I made peace with my predicament. But that didn’t mean I wasn’t going to seek some way to catch a glimpse of a much-loved Pope. Could I nip up to the stalls during a quiet moment? I left messages with all those within my circle of influence to try and work out an opportunity for me. But it looked bleak. So now here we were squeezed into the booth. 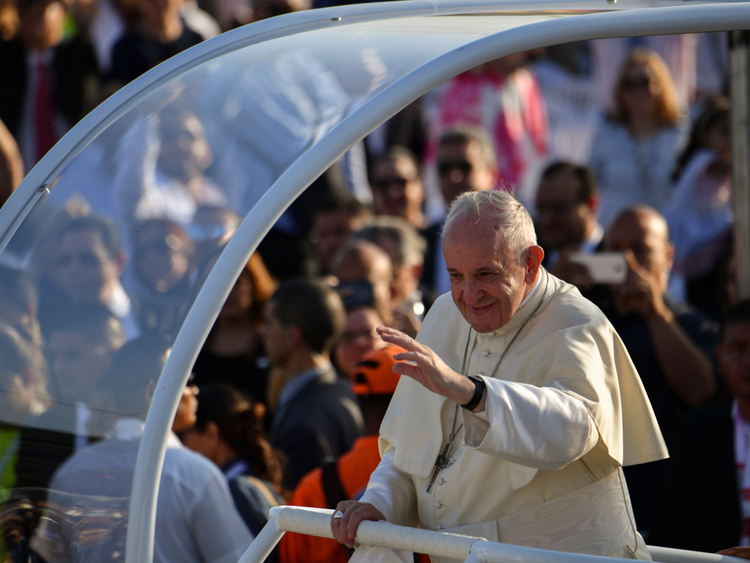 Literally on top of our heads, Pope Francis was being driven around in an open-air vehicle as crowd hysteria went into overdrive. The Mass began, the glorious hymns began. And we began our commentary, with no assurance whatsoever that our voices were being relayed or heard! The Mass came to an end and we to the last word in our script. “Let’s see if we can go have a glimpse,” said the priest from Argentina. We gathered up our things and fled our booths. Under the sun, on the periphery of the stadium, we scurried forth coming up against a soldier, his hand cradling a gun. We were told not to move until he gave the go-ahead. Up on the ramp, some 500 metres away, sleek black official-looking SUVs were parked one behind the other. Rather dwarfed in the back was a black Kia Soul. Could it really be that we had inadvertently stumbled upon the one exit out of dozens from where Pope Francis was to leave? “He has gotten in,” the Argentine priest said, “and here he comes.” Our phones were out and trained. The Kia rolled down the ramp; we could see Pope Francis seated on the right — the side closer to us — his head turned away; his window, rather miraculously, was half way down. All of a sudden came a volley of words in the loudest Spanish I had heard! It was our multi-lingual priest from Argentina. “Padre Jorge, Padre Jorge!” he shouted. Immediately Pope Francis turned and looked out of the window. “Forza, forza (Be strong),” our priest continued, while we waved. A huge smile erupted on the pontiff’s face and he eagerly waved back ... as though he had chanced upon some long-lost friends!